Edna Andrade's Updraft 2, 1976 is currently on view at the Delaware Art Museum. The museum recently underwent a major renovation and re-installation of Gallery 17, their exhibition space for contemporary art. 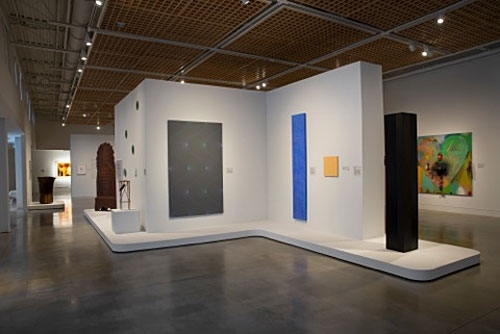 Currently devoted to works of the museum's holdings of 1960 to the present, Andrade's geometric abstraction is joined by representative works from minimal and conceptual art alongside other local contemporary artists from the past two decades. "When the Museum reopened in 2005, it had approximately 1,000 contemporary works, but in just eight years, this collection—the fastest growing of the Museum's four main collection areas—has significantly expanded," explains Margaret Winslow, Associate Curator for Contemporary Art at the Delaware Art Museum. "Over 400 works have been added, including 50 works from The Dorothy and Herbert Vogel Collection in 2008. The vast majority of these new works were never on view."